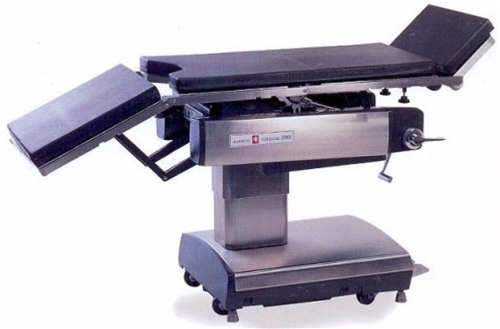 The Amsco Quantum 2080 General Surgical Table is supplied with a removable headrest unit, pendant hand control unit, and a set of electrically conductive table top cushions. This surgical table is electrically powered and requires 120v/60Hz power supply. Its weight capacity is 300lbs. AMSCO 2080 GENERAL SURGICAL TABLES ARE BUILT WITH QUALITY AND ARE BUILT TO LAST. The Amsco 2080 General Surgical Tables are easy to use, versatile and well within your budget. The Amsco 2080 General Surgical Tables are designed to accommodate a maximum 300 pound load. Pedestal includes tabletop lift cylinder and support column with bearing-mounted saddle frame fully enclosed by stainless-steel, telescoping shrouds. Each shroud is one-piece construction to ensure against foreign matter entering the elevating mechanism. Tabletop is 20-inch wide tabletop is divided into four hinged sections: head, back, seat, foot. Each section is cast aluminum (back, seat, and foot sections are covered by stainless-steel veneer).